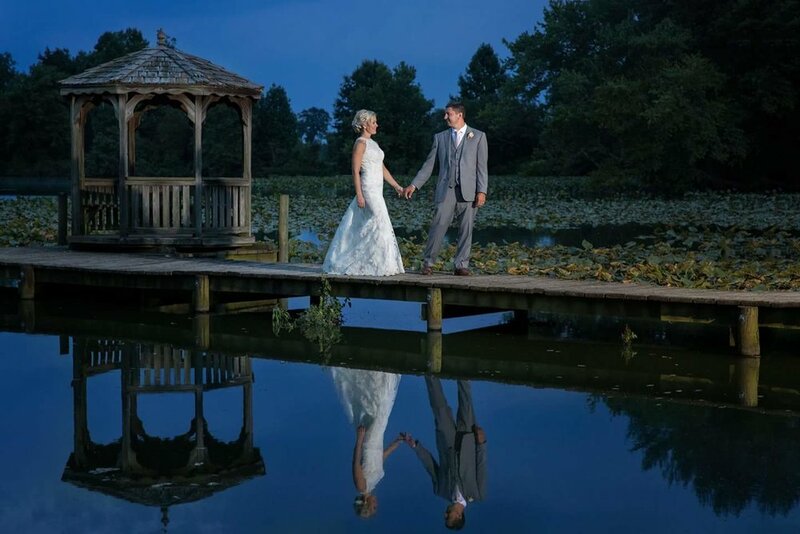 At Hollyfield Manor, our goal is to give you the wedding you've always dreamed about. A wedding that reflects your unique personality and style and one that you and your guests will delight in. Discover the romantic grace and charm of Hollyfield Manor and see how we can create the perfect Southern wedding that is uniquely yours. Hollyfield Manor is a mid 18th century manor house which has been carefully renovated to capture its original elegance. The manor has a picturesque and romantic farm setting with surroundings of towering holly trees, magnolias, boxwoods, and overlooks a spectacular water view. An elegant yet comfortable venue to host all of your wedding festivities. Your bridal party is welcome to begin preparations early with relaxing and getting ready in our luxurious bridal suite and the men in the grooms corner. You can choose to have your ceremony in front of our stately barn, on the steps of the Manor or on top a hill overlooking the gorgeous lake view. Events flow beautifully into an intimate cocktail hour space in a rustic chic bar area and court yard; complete with hors d’ourves and refreshments. The perfect time for portraits and for your first moments as Mr. & Mrs. Then the party moves toward the reception hall, the celebration begins with dinner and then continues with dancing the night away. Experience a Southern Farm With Elegance and Charm. Contact us today at (804) 495-5122.